In this article I will not talk about what HTML5 added, but I will rather focus on what is new in IE10 mobile, i.e. the browser that comes with Windows Phone 8. At the end of the article I have collected a few useful links that cover HTML5 forms at large and provide more examples and complete support tables. All the code examples are meant to be cross-browser, unless specified. IE10 and IE10 mobile are substantially the same browser. In I will try to highlight some different behaviors often determined by the different hardware configurations and environments. 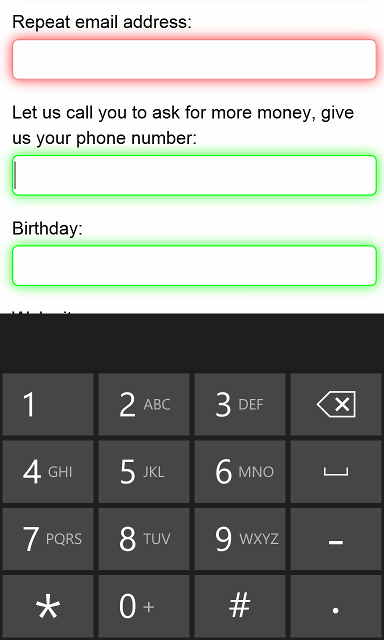 To give you an idea consider the input element, it now supports a new state for the type attribute: “number”; if you are using a PC with a full keyboard you will not see any difference, but if you are using a device like the Lumia 920 with a virtual keyboard, that keyboard will only show you numbers. Try using the “tel” state and the keyboard will show numbers, the plus sign, the dash and the space. These simple enhancements will make the life of your users a lot easier. This different behavior in different environments is true for pretty much all browsers and all OS’s. As of today, IE10 implements most of the HTML5 spec related to forms and in fairness none of the current browsers covers 100% of the spec. The good news is that all modern browsers have wide coverage and they all degrade gracefully when something is not yet supported. As mentioned there are a few things that are not yet implemented and I suggest you check can I use for more details on cross-browser support and look at the official Microsoft documentation for the specifics of IE10. Although IE10 supports most of the improvements to forms it does not support the output element, Microsoft doesn’t clearly state if it supports it or not, so I thought I would clarify. Custom validation error messages are supported in Windows 8, but not on mobile. Custom validation error messages are not supported in iOS 6 or Safari 6. Similarly, the datalist element works in Windows 8, but not on Windows Phone 8. HTML5 defines a number of new properties for the input element such as valueAsNumber, stepUp and stepDown, Microsoft’s documentation says they are supported, but I could not get any of these to work on either Windows 8 or WP8. Either way, there is no reason for you not to use it as it degrades gracefully and we can expect that it will be implemented at some point. Update: The stepUp and stepDown methods actually work when the input type state is “range”. How does it compare to other mobile OS’s? Here is a quick summary table of the features that are not consistent across different OS’s. I recommend that you look on can I use for more details and of course always test on real devices. I built a simple form covering some of the new features of HTML5 forms. First of all I wanted to show how the new elements and attributes behave in IE10 mobile and how some gracefully degrade. This is how it looks like in Chome 22 (probably the most complete implementation today) and how it looks like on a Lumia 920. You can try it yourself at http://logme.mobi/html5/form.html. Look at the code and feel free to take what you need, but don’t expect accurate error checking and validation unless it’s specifically useful for this article. As you can see the placeholder texts are there, some fields are surrounded with a red glow and some with a green one, these are defined in CSS using pseudo classes for required and optional fields. 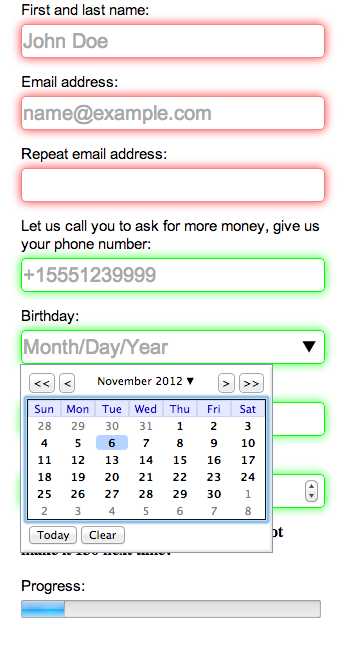 You might have noticed that Chrome shows a placeholder for the birthday field, that’s because the browser correctly interprets the “date” state for the type attribute of the input element, but on IE10 mobile this field is treated like a normal text field (the expected graceful degradation). min="10" step="10" title="Type the amount, only multiples of 10"
<input type="number" id="donation" name="donation" required min="0"
As you can see I used valueAsNumber in both example. This is another handy addition of HTML5, unfortunately I could not get it to work in IE10, of course you can always use .value. This article covers most of the new implementations in IE10, but not everything. I have collected more resources that I think are very valuable, if you haven’t read them yet, I strongly suggest you do it now. This article is cross-posted on Nokia Developer.